TANTALIZE: KIEREN’S STORY by Cynthia Leitich Smith, illustrated by Ming Doyle (Candlewick, 2011). TANTALIZE as you’ve never seen it before —from a Wolf’s-eye view! As a hybrid werewolf, Kieren is destined to join an urban Wolf pack and learn to master his shift. Soon, he’ll leave everything behind home, school, his family, and Quincie, his human best friend…who’s beginning to be a whole lot more than a friend. For years, Kieren has managed to keep his desires—and his Wolf—at bay. 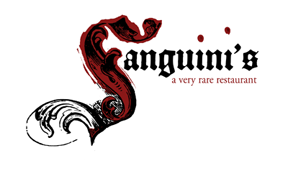 But when the chef at Quincie’s family restaurant is brutally murdered, Kieren resolves to be there for her, even if it means being framed and even if it means watching Quincie’s beloved restaurant morph into a vampire lair. But when the new chef begins wooing Quincie, how long can Kieren control his claws? How long can he protect her—and himself? 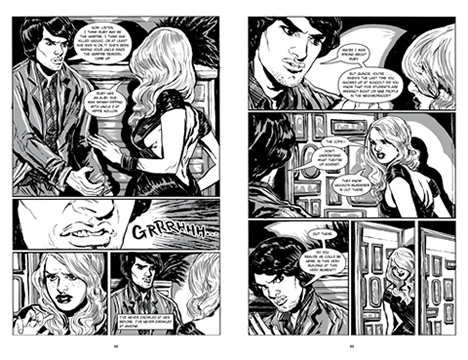 In an elegant graphic edition featuring cinematic sequential art by debut artist Ming Doyle and a lush, romantic cover by Sam Weber, best-selling author Cynthia Leitich Smith re-envisions her delicious dark fantasy through Wolfish eyes. Order TANTALIZE: KIEREN’S STORY by Cynthia Leitich Smith. Learn more about TANTALIZE (Book 1)(Candlewick, 2007), ETERNAL (Book 2)(Candlewick, 2009), BLESSED (Book 3)(Candlewick, 2011), DIABOLICAL (Book 4)(Candlewick, 2012) and the tie-in graphic novels TANTALIZE: KIEREN’S STORY, illustrated by Ming Doyle (Candlewick, 2011) and ETERNAL: ZACHARY’S STORY, illustrated by Ming Doyle (Candlewick, 2013). SEE ALSO the spin-off FERAL trilogy (Candlewick, 2013-2015). Click to view larger version. Text copyright © 2011 by Cynthia Leitich Smith. Illustrations copyright © 2011 by Ming Doyle. Ming Doyle was born in Boston to an Irish-American sailor and a Chinese-Canadian librarian. 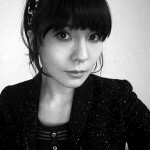 She earned her BFA from Cornell University with a dual concentration in painting and drawing. She has since depicted the exploit of zombie superheroes, demonic cheerleaders, vengeful cowboys, and dapper mutants. TANTALIZE is her first full-length graphic novel—and marks her first encounter with a wereopossum. Shop Sanguini’s at CafePress for TANTALIZE-FERAL verse T-shirts, hats, mugs, posters & more. Cynthia has published short stories set in the TANTALIZE-FERAL series universe. “Cat Calls” first appeared in SIDESHOW: TEN ORIGINAL TALES OF FREAKS, ILLUSIONISTS, AND OTHER MATTERS ODD AND MAGIC, edited by Deborah Noyes (Candlewick, 2009). It is available as a free e-book. 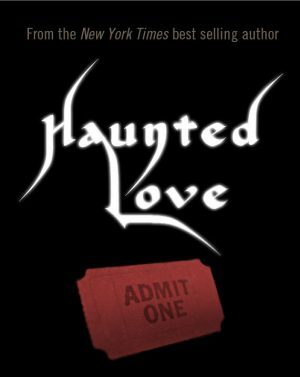 “Haunted Love” appears in IMMORTAL: LOVE STORIES WITH BITE, edited by P.C. Cast (BenBella, 2008). It is also available as a free e-book. “Cupid’s Beaux” appears in THINGS I’LL NEVER SAY: STORIES OF OUR SECRET SELVES, edited by Ann Angel (Candlewick, 2015).